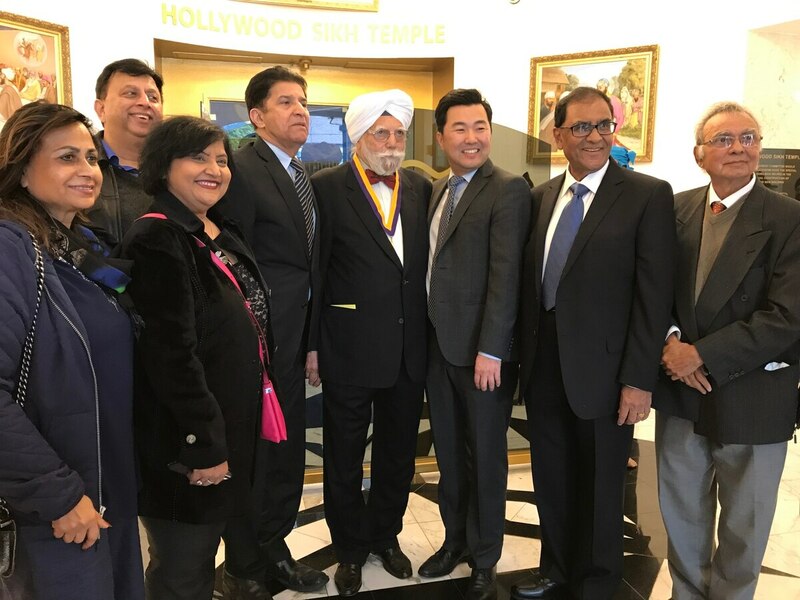 Since 1962, Dr. Amarjit Singh Marwah has worked to established the Sikh community in Los Angeles, collaborated with local leaders and taught dentistry at USC. One man's efforts to integrate the Sikh diaspora into the city for nearly 60 years have earned him recognition within his community and beyond. 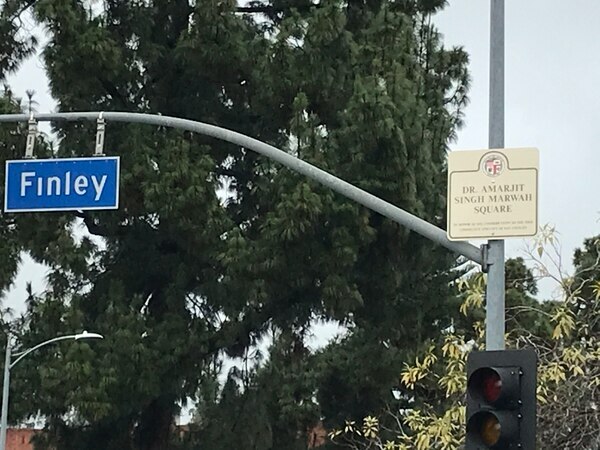 The ceremony Monday was held at the corner of Vermont and Finley avenues, where in 1969 Marwah founded the Hollywood Sikh Temple, a grand white building topped with domes. It became the first Sikh temple in Los Angeles. Councilmember David Ryu presented Dr. Marwah with the sign at Monday's ceremony, the same day as his 93rd birthday. "Not only will people see the temple, but young people, future generations, will look up and see the sign 'Dr. Marwah Square' and they'll say 'Who is Dr. Marwah?'" Ryu said. "They can Google it and learn about Sikh-Americans, about Dr. Marwah, about the Sikh community." Marwah began studying dentistry in India and continued his studies after moving to America with a Fulbright scholarship. During his time in Los Angeles, he was a guest lecturer at the USC Herman Ostrow School of Dentistry, among other universities such as UCLA. A longtime family friend of his, Los Angeles resident Ranjit Bhatia met Marwah at the Sikh temple after moving to the United States with her family from India in 1970. Bhatia explained how Marwah created a close-knit community through the temple. She also said her family witnessed Marwah's generosity towards the community over the years. When her mother was hospitalized, the Marwahs took in her family for a couple of weeks. "They were the extended family," said Bhatia. "They were like the godparents to everybody around my age." Marwah has influenced Angelenos beyond the Indian community, Bhatia continued. Because the Sikh community was a small population when he first arrived to the West Coast in the 1960s, Marwah spent much of his time connecting with more traditional Angelenos. "We're comfortable meeting our own people, so they tend to self-segregate in a way," Bhatia said. "But he encompassed everyone. He had to deal with the community at large, whether they were Indian or not, because there were fewer of us at that time." Marwah also worked with the Cultural Heritage and Hollywood Art Commission for the City of Los Angeles under former Mayor Tom Bradley to preserve historical buildings throughout the city. "Not only did he serve the Sikh community, but he served the greater Los Angeles community," Bhatia said. "It's really nice having that recognition given to him." After the street sign was unveiled, Sikhs chanted, "Bole So Nihaal! Sat Sri Akaal!" which indicates the Sikh belief that all success is God's. Bhatia said these Angelenos are grateful for Marwah's contributions toward a more inclusive, multicultural community. "They kept trying to help everyone," Bhatia said. "They didn't expect anything in return." 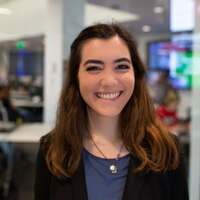 Sophomore journalism major, Bay Area native, arts and culture fanatic.